Despite insurers’ best efforts to increase rates to compensate for losses, commercial auto continues to be an unprofitable line. In less than a decade, despite continued increases in premiums, two major carriers have exited the business. The line’s poor performance is said to be the result of years of underpricing for frequency and severity, but some believe there is more to it than inadequate underwriting. The answer to a return to profitability, they say, lies in the combination of continued rate increases, recognizing the drivers of severity and advances in technology. The National Association of Insurance Commissioners’ 2017 First-Half Results report for the U.S. property/casualty insurance industry notes that despite years of premium increases, the commercial auto pure direct loss ratio deteriorated two points from the previous year to 66.4 percent. The Council of Insurance Agents & Brokers (CIAB) in its first-quarter 2018 broker survey said premium increased for the 27th consecutive quarter by an average of 7.7 percent. Some brokers noted increases as high as 30 percent on some accounts. Others said some carriers were pulling out of monoline auto altogether. A report from Conning said the combined ratio rose 20 points from the period 2007 through 2016 to 112 percent, with some slight improvement estimated by 2019. The CIAB report says that brokers expect the upward trend in both costs and claim numbers to continue “due to distracted driving and increasingly expensive vehicle repairs.” One broker reportedly said that placing certain types of risks was difficult and that placements could only be made through programs. However, there is a substantial gap between outperformers and underperformers of as much as 30 points on the combined ratio, with the top quintile of performers exhibiting a combined ratio of 88.8 percent while the combined ratio for the bottom quintile was 118.4 percent. Last year, Fitch Ratings reported the segment had a combined ratio of 110.4 percent for 2016, a 15-year high, producing six consecutive years of underwriting loss and a profit drag for U.S. P/C insurers. James Auden, managing director of Fitch Ratings, said the agency just released its 2017 report, showing that the combined ratio has worsened for the seventh straight year of underwriting loss, but there are indicators of a turnaround. Auden said getting a handle on claims is a major problem for many underwriters. Tremendous price increases have not made a dent in underwriting losses. Part of the problem is the risks they write. Progressive, for example, is the largest writer of commercial auto, but their risks are primarily small businesses and vary from livery companies to contractors with a small fleet of trucks. Other insurers deal with larger fleets and long-haul truckers, subjecting them to bouts of higher frequency. Progressive, he noted, is profitable because of its risks and sophisticated pricing—a carryover from its personal lines model. He also cited GEICO as another company that is successful in writing commercial auto for many of the same reasons as Progressive. 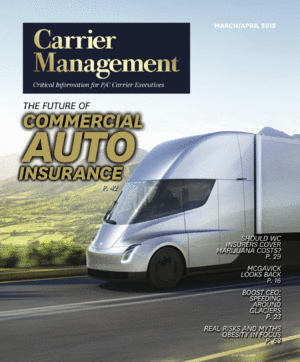 To deal with the issue of underwriting and selection, Auden said some carriers need to shrink their book of business, but this would be a problem for those offering commercial auto as part of their commercial package. For them, Auden explained, the company will have to make its evaluation of the risk based on the overall profitability of the risk. Generally, experts say there are several factors pointing to commercial auto’s poor results. The improved economy produced more vehicles on the road, and that increased the frequency of accidents. A tight labor market translates into trucking companies hiring less experienced drivers. Other contributing factors for higher losses are the increased use of in-vehicle technology, which can lead to more distraction for drivers and higher repair cost because vehicles have become more sophisticated. The most significant driver of underwriting loss is claim severity, Auden notes. Indications are that more bodily injury claims are being litigated and settlement verdicts are higher, hitting seven figures in more cases, and that is not changing. What some say is contributing to claim severity is the growth of third-party litigation funding— also known as litigation finance—impacting commercial auto suits. Essentially, the practice involves a third-party financier providing money to an attorney to finance a suit in exchange for a portion of the settlement. The bet is there will be a substantial recovery providing a large return to the investor. The downside is if the case is lost at trial, then the investor also loses. What the providers of litigation financing cannot do is violate the rule of champerty. Defined by Webster’s, champerty is “a proceeding by which a person not a party in a suit bargains to aid in or carry on its prosecution or defense in consideration of a share of the matter in suit.” The legal opinion is that the financing is permissible so long as the investor is not involved in the litigation. Litigation financing began in Australia and moved to the United Kingdom as a way to provide funds where plaintiffs did not have the resources to finance their own litigation. The practice spread to the United States in the mid-to-late 1990s, becoming a growth industry for investment firms and hedge funds seeking new investment vehicles. Some estimates value the industry well north of $1 billion, with dozens of firms specializing in the field and continued growth on the horizon. The funding falls into two distinct practices. Litigation funding is typically put into place at the outset to cover fees and costs in exchange for a percentage of the recovery. The other practice is legal funding, which amounts to a loan for the personal use of the plaintiff. This practice is often criticized for usury rates and leaving plaintiffs without benefit to the settlement. Proponents of litigation funding say that because litigation is so costly, the practice allows plaintiffs who could not otherwise afford it to be placed on an equal footing with deep-pocket defendants. However, those in commercial auto insurance see a much less benign practice driving settlement costs and negatively impacting reserves. John J. Ferrante, general counsel and vice president of litigation management for Massachusetts-based Energi Insurance Services, said the influence of litigation funding causes claims that would normally settle in a five-figure range to settle at seven figures. The investors are seeking a return, said Ferrante, and the influence of that money makes it more difficult to reach a reasonable settlement. Medical bills and lost earnings are the main drivers of a claim’s value, and the financing allows plaintiffs to pursue unnecessary procedures to increase costs. The increased numbers drive value and increase settlements. Ferrante shared a recent case in which two accident victims, hit by a distracted driver, had two very different outcomes. Neither was injured seriously, he said, and the passenger settled for $45,000. The driver, however, had multiple medical procedures and ended up with $400,000 in medical bills. A finance company had paid the plaintiff $180,000 and secured an agreement to pursue a verdict of $7 million-plus. Under the agreement, if the plaintiff won, she would have received 20 percent of the settlement, her attorney one-third, and the remaining 50 percent would have gone to the finance company. “The returns were enormous,” noted Ferrante, but in this case the defense won, in part because the third-party financier was revealed to the court, and the finance company took the loss. Despite the win, the insurer still had significant expenses for the cost of defense. Such examples of abuse and inappropriate activity drive reserve deficiencies for insurers, and the insurers’ defense is all the more complicated because plaintiffs are not required to reveal the involvement of third-party financiers. Adding to the mix of investors, Ferrante noted, is the rise of GoFundMe pages where plaintiffs or attorneys can pursue investors to support their litigation. At least one state, Wisconsin, has adopted a provision requiring the disclosure of litigation funding arrangements, writes Kevin M. LaCroix, author of “The D&O Diary” blog. “The state’s action is just the latest step in what seems to be a general move toward requiring disclosure,” he said. He notes that in California disclosure is required of third-party funding in class action lawsuits and there is a proposal pending to revise the Federal Rules of Civil Procedure to require disclosure. Another major defense against litigation is technology, said Justin P. Russo, senior vice president of risk management for Energi. He noted that a dashboard video camera can tell a different tale from a plaintiff’s claim and quickly alter the outcome of a case. Other technology, such as telematics, can tell the vehicles speed, how the driver maneuvered and how quickly the driver stopped, revealing a picture that could have a significant impact on the case. He added that technology, such as collision avoidance systems, can help to avoid the accident in the first place. While underwriters strive to bring commercial auto back into the black, the expectation is that it will take time. Mark E. Ruquet is award-winning insurance journalist and freelance writer based in New York.